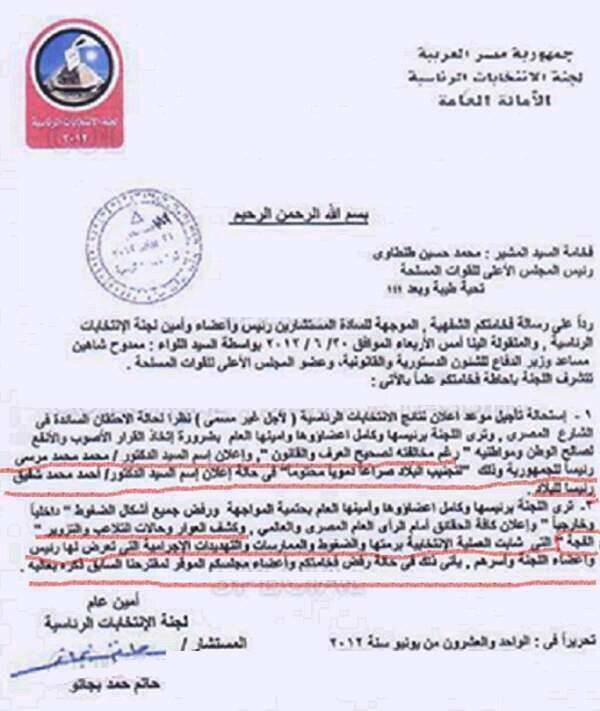 On the 21st of September 2013, an Original document evidence appears, which proves Egyptian Presidential Elections Fraud year 2012, in favor of Mohammed Morsi, the Muslim Brotherhood candidate! On 4/12/2013, the judicial source Consultant Adel Idriss, the appointed judge by the Ministry of Justice decided to run investigations with some judges who were accused of participating and involved in presidential elections forgery and declared lifting the judicial immunity of judges belongs to “judges for Egypt” movement who were supporting Mohamed Morsi candidate of Muslim Brotherhood. These judges were also accused of inciting and directing voters to vote for Muhamed Morsi in the presidential elections. It was declared earlier by the investigations assigned judge to ban the press from publishing any details about this case on 28/10/2013, till another announcement. On 26/1/2014, a judiciary source declared that the court will announce the date of final verdict anytime now, to bring the curtain down on one of the important cases that occupied the public opinion in Egypt. The Following is a copy of the Original Document, which was addressed from the Chief of Presidential Elections Hatem Bagato (Mohammed Morsi appointed him later, as his Parliamentary Affairs Minister) to The Chief of the Military Mohamed Tantawy, dated 20/6/2012, which proves that the one who won the elections, was General Ahmed Shafiq and Not Mohamed Morsi. This is a written response to your verbal message request to the Counselors, Chief, members and Election Commission’s Secretary of the Presidential Elections, which received by us yesterday, dated Wednesday 30/6/2012, through General Mamdouh Shahin Deputy of the Minister of Defense for legal and Constitutional Affairs and member of the Superior Army Council. 1- It is impossible to delay the date of Presidential Elections Results (for indefinite), due to the spreading congestion status in the Egyptian Street. Thus, we the Committe of Presidential Elections,Chief and all its members see the necessity of making the right and the useful decision in favor of the country and the Egyptians Citizens “despite the fact that this is a violation against the Law”, and to announce Doctor Mohamed Morsi, President of Egypt in order to avoid the country bloody conflict destiny, if we announce that General Ahmed Shafiq is the President of Egypt. 2- Or The committee of Presidential Elections,Chief and all its members see the necessity of confrontation, and the reject of all kinds of pressures:”Pressures from the inside and the outside”, and to announce all facts to the Egyptian Public Opinion and the International Public Opinion, and to reveal all Gross defects, detection, manipulation and Elections forgery, which all marred the electoral process as a whole. In addition to the pressures, the practices and the Criminal Threats which we Chief of Presidential elections and all presidential elections committee members have faced and also direct criminal threats to our families. We are mentioning this point 2, in case your excellency rejects our above mentioned suggestion in point 1.